When Graham Goode released the Hauptwerk 3 version of Joseph Basquin’s “Jeux d’Orgues” Stiehr-Mockers organ, the organ community had an excellent free (assuming one already owns Hauptwerk, of course) 19th century organ. The only problem is that it is a two-manual organ. Not to say there is anything wrong with two-manual instruments – but my home console has three and I don’t like to see keyboards going to waste! 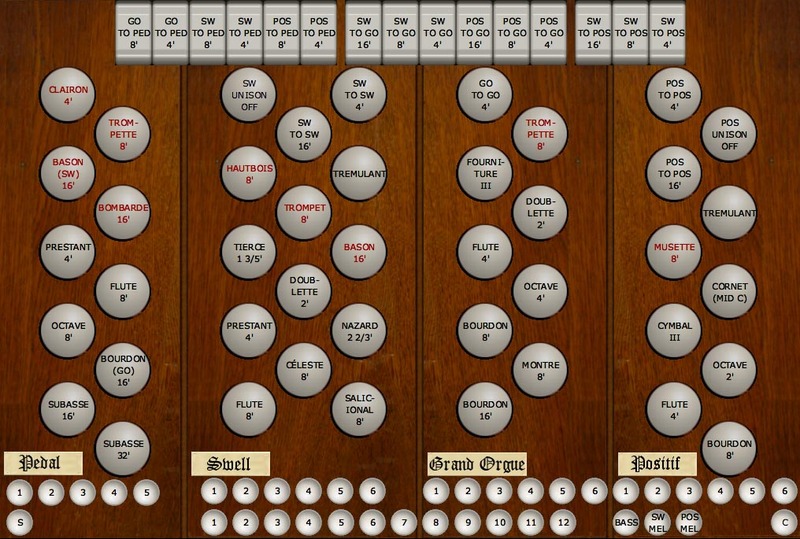 You can find and download the Jeux d’Orgues” Stiehr-Mockers organ at http://www.jeuxdorgues.com/en/home.php You will need to do this before load my instrument. 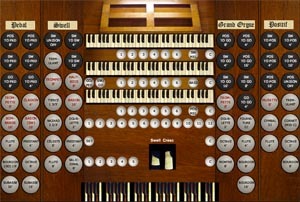 I embarked on this project to create a three-manual version of the Stiehr-Mockers organ. As in all of my organ design projects, I am not trying to recreate any specific instrument. Instead, I am creating satisfying instruments of important styles that I can use for my own enjoyment. 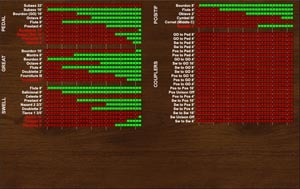 This organ is created using Hauptwerk’s CODM and I make the source code available to others so they can see what I have done and maybe improve upon it. I call this organ “Jeux d’Orgues d’Trois Claviers” which is French (I believe) for “Organ stops on three manuals” or something close! Version 1.2 sports a new set of screen backgrounds designed by Graham Goode. In addition, he embarrassed me into renaming the old “Great” division to “Grand Orgue” which makes a lot more sense for this decidedly French instrument. Finally, I have replaced the utilitarian stop buttons with smaller versions of drawknob controls in the Console view. Version 2 of theOrgan has been updated to take advatage of several new features in Hauptwerk 4. It will not run in Hauptwerk 3. If you do not have Hauptwerk 4, you can still run Version 1.2 of the Jeux d'Orgues d'Trois Claviers. Version 2 sports a crescendo pedal, courtesy of Al Morse's software plus my own special software to massage Al's output into the graphical displays I have created. I have also completey rewritten the tremulants. Version 2.1 fixes a minor bug in the sampling rate that effected only the lower few notes of the 16' reeds. Version 3.0 repairs an error in the swell enclosures that caused ranks to sound brighter when the boxes were closed. A new version of this organ is now available as revoiced by Mark Williams. I used most of the Great from the Stiehr-Mockers organ intact. Only the Salicional and Cornet were removed so they could be used on the other manuals. The Positif uses Stiehr-Mockers Swell Bourdon as its foundation. The 4’ Flute is a quieter version of the Great 4’ Flute. The 2’ Octave uses the top four octaves of the Stiehr-Mockers Great 4’ Prestant, voiced a bit brighter. The low octave comes from the Stiehr-Mockers Great 2’ Doublette, voiced to match the rest of the rank. The Cymbal and Cornet are unchanged. The Musette uses the samples from the Stiehr-Mockers Great Trompette, greatly brightened and softened. The Swell 8’ Flute is a brightened, softer version of the Stiehr-Mockers Great 8’ Flute. The Salicional is original, but I softened it a bit to blend with this division. I used its samples a second time (still softer) to create the Celeste. The upperwork is all from the Stiehr-Mockers unchanged – although I softened the Tierce a bit for my own taste. The Bason uses the Stiehr-Mockers Hautbois samples for the top four octaves and the Pedal 16’ Bombarde for the low octave. I brightened the Bombarde and matched the volume of the two ranks. The Pedal is exactly from the Stiehr-Mockers with two added borrowed stops to add to the flexibility of the instrument. I also added a comprehensive set of couplers – because its easy to do this in the CODM and you can never tell when you'll need them! Finally, I added a combination action to match my Rodgers console. Since my own touch-screen monitor is only 15” (a size which fits nicely above a side-jamb of a typical organ) all my screens are sized to fit. The resolution is 1024 x 768. "The personal use of these soundbanks is free. However, you must contact Joseph Basquin for public or commercial usage, or if you want to publish Jeux d’orgues, or a modified version of Jeux d’orgues, on CDs, Internet, or by any other method. This soundbank still is and will remain free, but don’t forget that most similar soundbanks are not free, but rather expensive (usually more than 200$ for Hauptwerk/MyOrgan historical organs). This project will only be able to continue with your donations. Don’t forget to donat and help this project grow!" This is a Hauptwerk standard installation package in rar format. Save it to your disk and then start Hauptwerk, and then use its install feature to read the rar file as per the manual. This one is optional. I provide the source code for the Hauptwerk editor so you can see how I did all this and get ideas for your own projects. You will have to remove the txt extension on this file before you use it with Hauptwerk. This organ is a real value. You get ~40 ranks for fee (I get nothing - but I have great a day job. You might also consider contributing to the Jeux d'Orgues project on their web site) This organ is a small three manual instrument - but the divisions are complete enough for most organ repertoire. The complete set of couplers and combination action certainly helps! 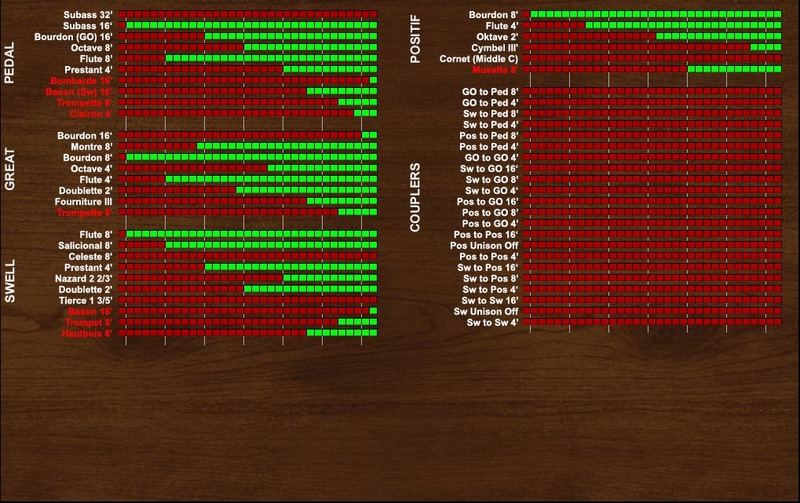 Since the samples are 16-bit, the instrument fits into RAM on all but the very smallest computers. The reverb on the samples is more than adequate for practicing. I add a additional convolution al reverb on my recordings - but this is a matter of taste. This makes a great low-cost alternative to my Composite 3 Manual English Organ for people starting out with Hauptwerk or on a limited budget. 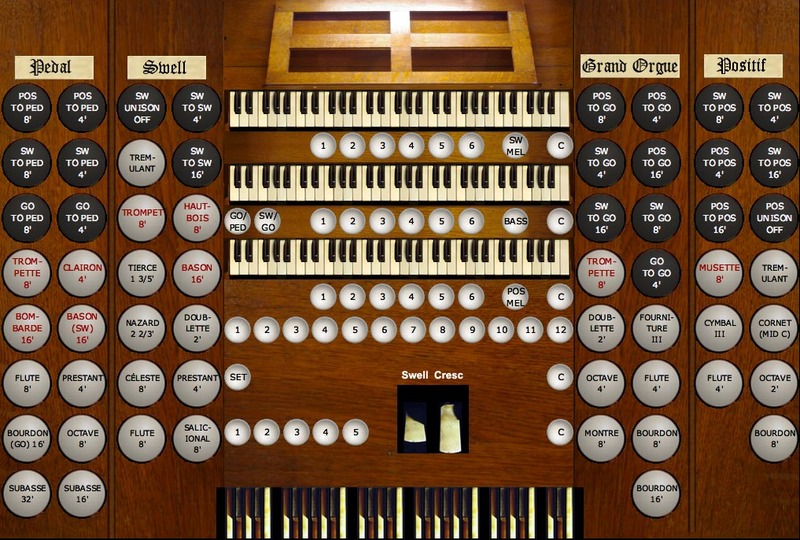 If you want something a bit larger, try my Model 945 organ, which makes extensive use of the same Jeux d'Orgues samples plus rtanks from other "free" instruments. You can hear some demo recordings of this instrument on my organ recordings page.